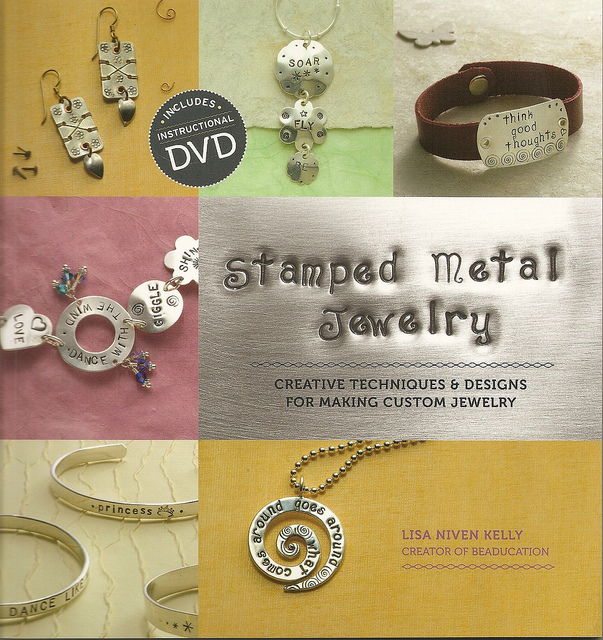 Stamped Metal Jewelry by Lisa Niven Kelly is a great beginner's guide for those of you interested in starting to work with metal! These beautifully photographed step-by-step tutorials will teach you everything you need to know to not only start stamping metal blanks, but also cutting, shaping, and creating your own unique pieces. The introduction includes a 10-page tool and material guide to help better explain what you need to be using and why.The 19 projects included in this book are simple enough to not scare you away, but intricate enough to make you feel like you've created a complex one-of-a-kind metal jewerly piece. They will definitely keep you busy! My favorite is the Silver Framed Gems pendant (pg. 88). It is a gorgeous gemstone wrapped in a pretty stamped piece of metal - a beautiful way to escape the most common ways of wrapping gemstones. If the written instructions aren't good enough for you, Stamped Metal Jewelry also comes with an instructional DVD!